This entry was posted in Uncategorized and tagged humor by ihatethesoundsaroundme. Bookmark the permalink. I love a good incestual Amish centaur story!! 🙂 do it!! But that’s not sales, it’s titles, right? 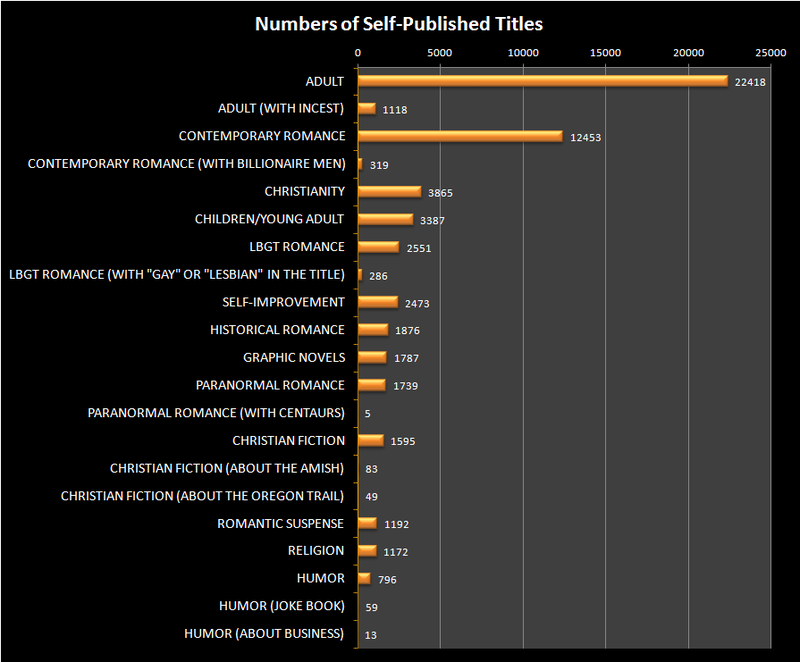 So you’ve picked the best genre, if you want to be one of 14 titles, rather than one of 22,419. True, that is the number of books published, not the sales numbers. In that case, you’re right about standing out in a category that has less population. However, I think that it might also tell something about the general market. In this case, I think that there is an important lesson here. It seems to indicate that people aren’t looking to read about work unless it assists with the improvement of their skills. When it doesn’t provide such advice, they are looking to escape it entirely. You left out Interracial Romance. It’s been around for a while, however in the last few years more indie authors (of diverse races) are creating novels for the genre.There’s also Urban Romance and African American romance, genres that have a loyal readership. I did omit a few categories, so that the list wouldn’t be too daunting in terms of its size. As you have surmised, interracial romance was one of them. However, the data does suggest that paranormal romance is squeezing out interracial romance.